With the long weekend right around the corner, I decided to wander off the beaten culinary path and do something a little different. 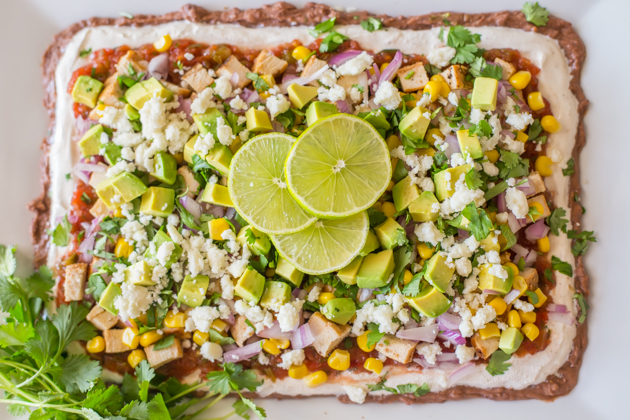 Traditions are wonderful and gathering together to celebrate our nation’s independence never grows old, but that doesn’t mean we can’t shake things up a bit when it comes to the holiday menu. While hamburgers and hot dogs are fun and enjoyable, it seems that many of us are trying to eat healthier, lighter and leaner these days. 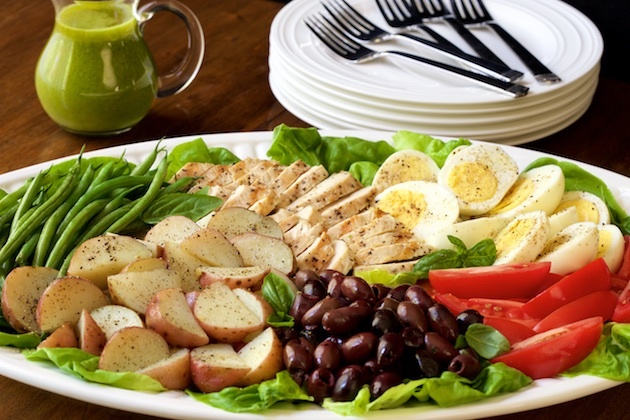 This Grilled Chicken Nicoise Salad is a fun and delicious way to feed a hungry crowd. The chicken breasts are prepared in a brine of 4 cups cold water, 2 tablespoons kosher salt and 1 tablespoon sugar, and left to brine for at least 1 hour and up to 4 hours in the fridge. This keeps them moist and tender for the grilling process. We used our KitchenAid® Stainless Steel 8 Burner Gas Grill, which has a wonderfully precise Even-Heat™ temperature control, making great grilling results super simple. Even with boneless chicken breasts, the Gas Grill does a great job keeping the meat moist, unlike with other grills where the meat can get dry and tough. It’s a gorgeous Gas Grill with a Ceramic Infrared Rotisserie Burner, which is great for rotisserie cooking. It also comes with a separate Infrared Searing Station for perfect, restaurant-quality steaks. I also love the beautiful Blue LED Lights on the control panel. The cobalt blue lighting makes this Gas Grill look like a work of art. You should see it at night! We’ve had a number of grills over the years, but this one is definitely the crème de la crème. It’s got so many great features: a large grilling surface, a premium grill cover, 6 main burners, so you can use as much or as little of the surface as you need, and a satin cross-hatch texture on the handles for a secure grip and easy clean up. The red signature medallions on the ends of the handles add a classy, professional look. This Gas Grill also comes with a slide out Tank Tray and can also be converted to natural gas, with an optional conversion kit. Along with grilled chicken, this classic French salad calls for potatoes, green beans, olives, tomatoes and hard boiled eggs. I paired my salad with a summery Basil Anchovy Dressing, for lots of bright, fresh flavor. The dressing is easily whipped up in a blender or food processor by blending/processing basil leaves, lemon zest and juice, garlic, anchovy paste, Dijon mustard, sugar, salt and pepper until the basil is finely chopped. Then, continue to blend/process while slowly adding olive oil. When smooth, transfer the dressing to a glass jar or container with a tight fitting lid and set aside. This dressing can be made up to 24 hours in advance. Be sure to shake it well before serving. Your remaining ingredients can be easily prepped ahead of time as well, making the salad perfect for entertaining. Simply boil some potatoes until fork tender in salted water, steam your green beans in a gallon sized zipper bag with water in the microwave until crisp and tender, and cut your eggs and tomatoes into bite sized pieces. Then, once your chicken and dressing are ready, you can begin plating up your salad. 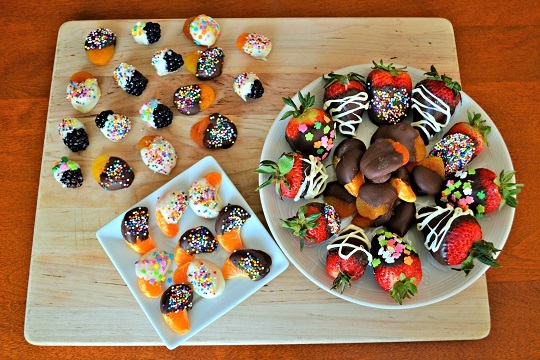 You can plate each person’s serving individually, or arrange all the beautiful ingredients on a large platter and let everyone help themselves. I like to do the latter, starting with a layer of lettuce on a large platter and then arranging the rest of my salad ingredients across the top. Leave the dressing on the side, or drizzle across the top. Surprise everyone at your next cookout with this fabulous, fresh salad. No one will miss the burgers and hot dogs this year! For the chicken, combine 4 cups cold water, 2 tablespoons kosher salt and 1 tablespoon sugar. Stir until the mixture is clear and all salt and sugar have been dissolved, about 30 seconds. Add the chicken and place in refrigerator for at least 1 hour and up to 4 hours. While the chicken is brining, make the dressing. Combine basil leaves, lemon zest and juice, garlic, anchovy paste, Dijon mustard, sugar, salt and pepper in the bowl of a blender or food processor. Blend/process till the basil is finely chopped. Slowly add the oil while continuing to blend/process. Stop when all the oil has been incorporated and the dressing is smooth. Transfer to a glass jar or container with a tight fitting lid. Set aside. Dressing can be made up to 24 hours in advance. Shake well before serving. Place the potatoes in a medium-sized saucepan. Cover with water and add 2 teaspoons kosher salt. Bring to a boil, then reduce to a steady simmer and cook for 8-10 minutes or until potatoes are fork-tender. Drain well and transfer to a bowl. Drizzle lightly with extra virgin olive oil and toss to coat. Season lightly with kosher salt and freshly ground black pepper. Set aside. Place the beans in a gallon sized plastic zippered bag. Add 1 teaspoon of water and close bag, leaving a small opening for steam to escape. Place bag in microwave and cook on high power for 3 minutes or until beans are crisp and tender. Drain the beans and place in a bowl. Drizzle lightly with extra virgin olive oil and sprinkle lightly with kosher salt. Toss to coat. 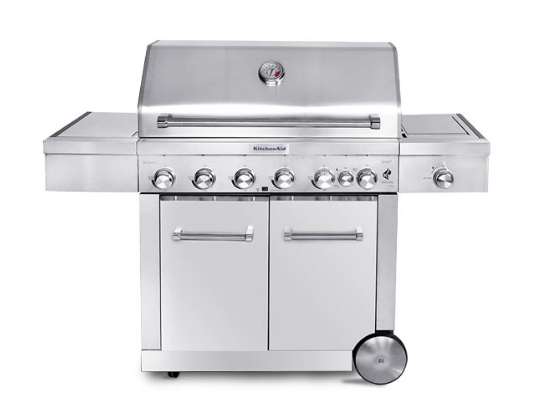 Preheat your KitchenAid® Stainless Steel 8 Burner Gas Grill to a medium-high heat. At about the same time you start the Gas Grill, remove your chicken from refrigerator, drain and pat dry with paper towels. Drizzle the chicken lightly with extra virgin olive oil and sprinkle lightly with kosher salt and generously with black pepper. Brush and oil the grill grate of your Gas Grill. Arrange the chicken on the Gas Grill and grill for 3-4 minutes per side or until light golden brown and an instant thermometer registers 160˚F. Remove from the grill and drizzle with a bit more olive oil and tent with foil for 5 minutes. Slice and serve warm or at room temperature. 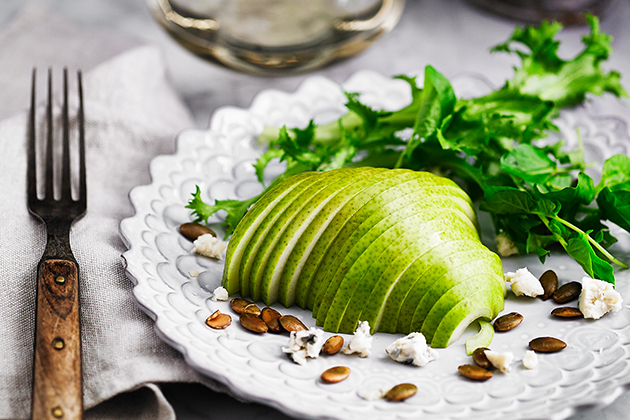 To serve, line individual plates or a large platter with lettuce leaves. Arrange the chicken, potatoes, green beans, and remaining salad ingredients over the lettuce. Serve with dressing on the side.